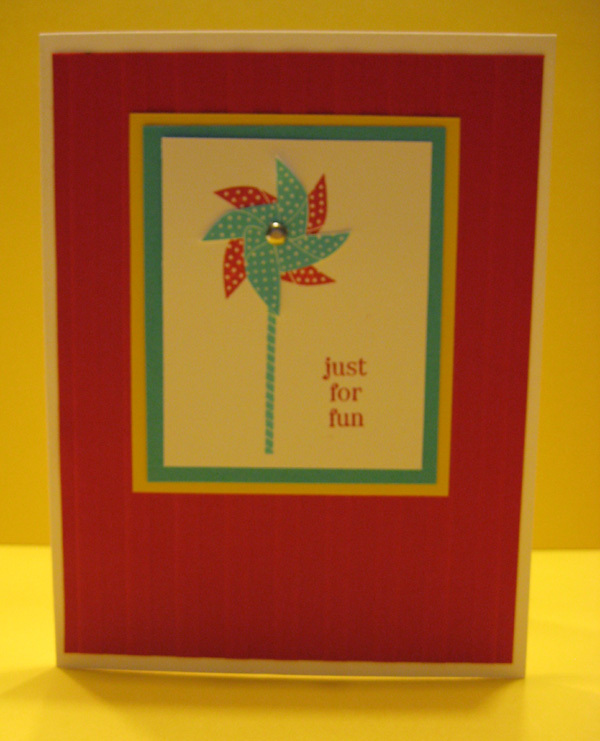 This was a fun card to make. The scallop dots ribbon has holes in it so it was easy to run the needle and thread in and out of the holes, gather it, knot it and put a brad through the middle to hide all of the stiches. Once again I am using my new set, My Friend, for this simple little card. I used about 4 inches of ribbon. This card doesn't seem all that exciting until you know how it was made. 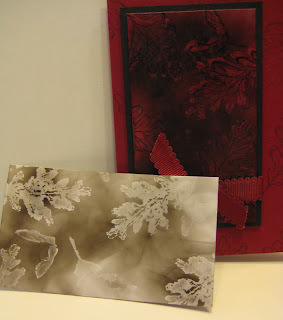 It is colored soot stamping and involves, glossy cardstock, a brayer and a candle! Start by brayering color over white glossy cardstock. 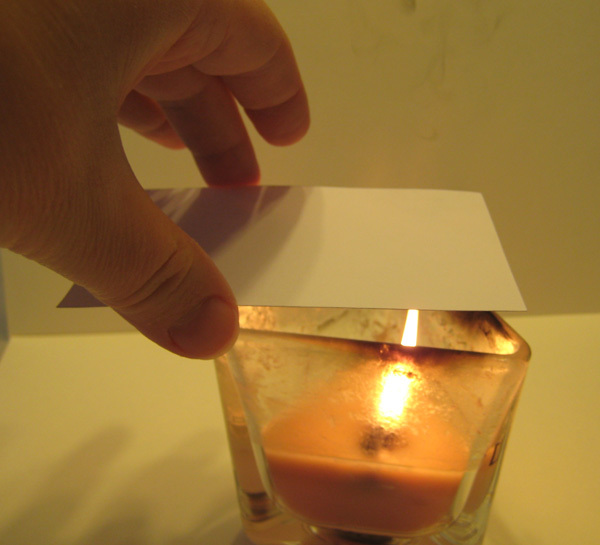 Hold the cardstock directly over the flame of the candle being careful not to catch the edges on fire. I used an especially sooty candle for best results. After you have covered the cardstock with soot, use your clean stamp to stamp directly onto the soot. 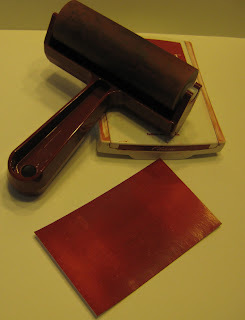 This will lift soot off of the cardstock to reveal the color below. Spray with an acrylic sealer (I used hairspray - an acrylic sealer probably works better, but I don't have acrylic sealer and have plenty of hairspray :-) to keep soot from rubbing off. I stamped on the Cherry Cobbler with the outline stamp in StazOn before I sprayed. Since it was such a dark color, I thought it needed to be done to make the leaves stand out. This is what the soot looks like on plain white glossy cardstock without the colored layer. 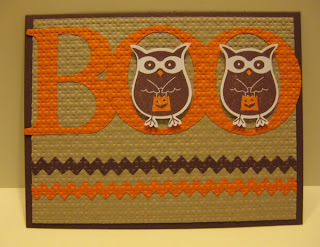 Great for Halloween cards! This set was available in the Summer Mini catalog and then turned up in the main Idea Book & Catalog. I couldn't resist any longer and ordered one for myself. 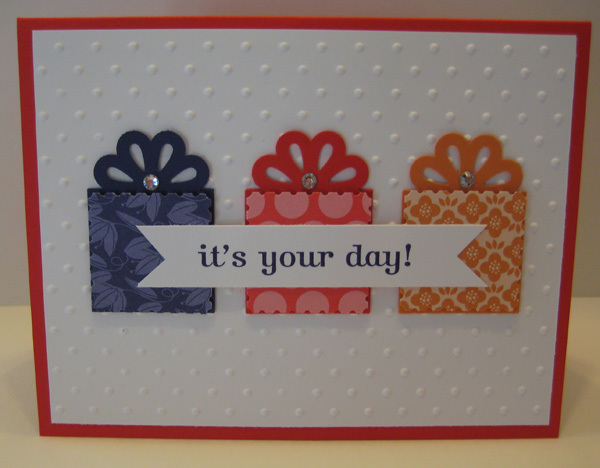 We made this card at my last stamp-a-stack using the Vintage Wallpaper embossing folder for the bottom layer. 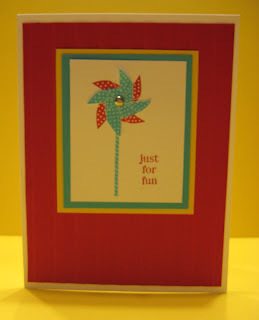 It is just such a simple and fast way to fancy up a card! 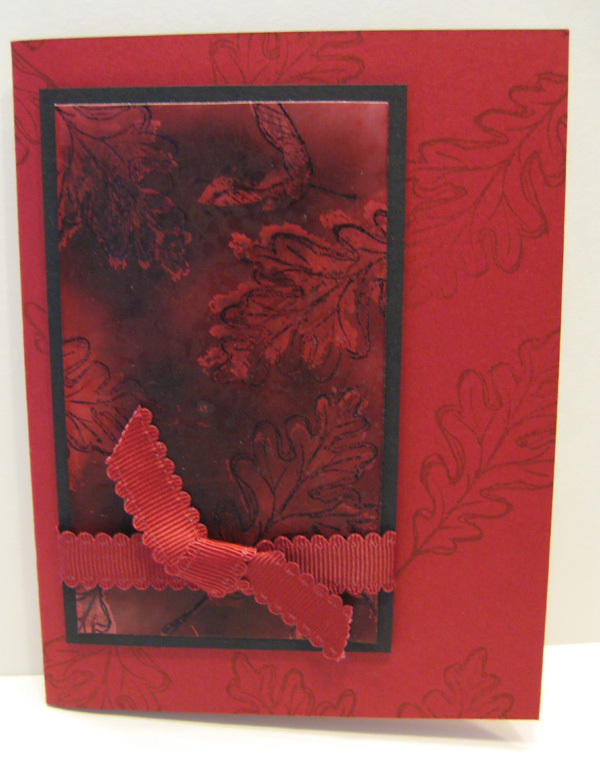 I recently participated in a Holiday Mini Catalog Swap with some other demonstrators. Here are two of the cards I designed when trying to figure out what I was going to make. I wound up switching the layout completely because at the time I thought these were too crowded. Looking at them now, I really like them. Sign up for my newsletter in the right sidebar to see the less cramped card I decided on. When I got my new Idea Book and Catalog in July, I knew Sweets for the Sweets would be one of the sets that I would order for myself. I just think it is so fun and can be used for both kids and adults. We made this card at my last all occasion stamp-a-stack. 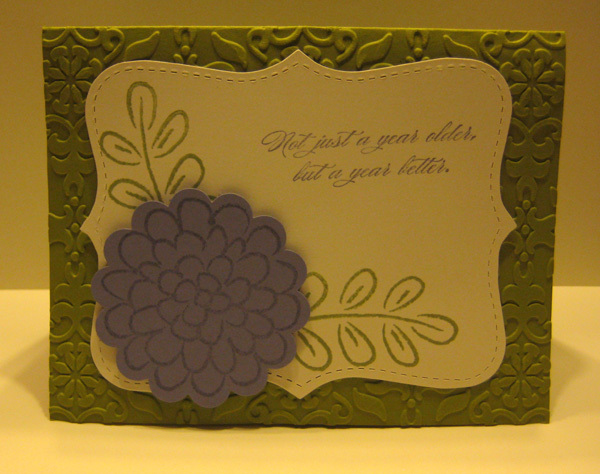 Some of the ladies turned it sideways before stamping which turned out great too. 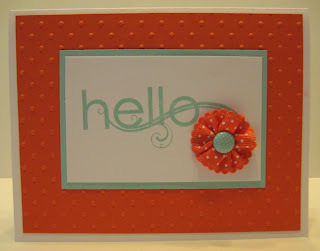 I absolutely love this swirly hello. 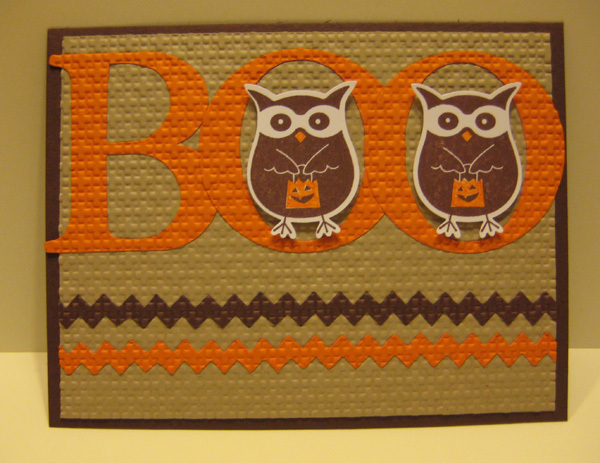 In fact, I love it so much, I bought a stamp set I didn't own and didn't think I needed to own. 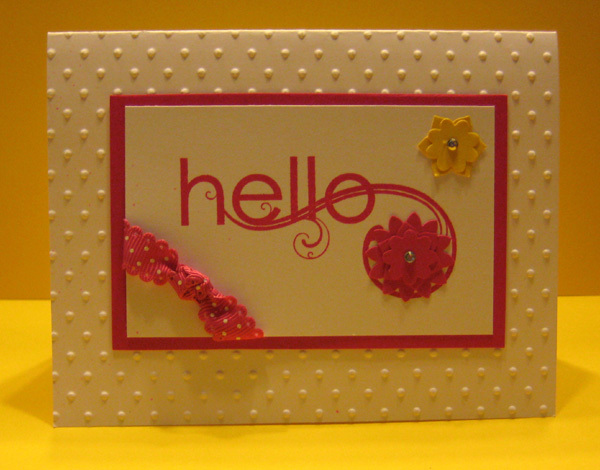 My Friend was a set we could pre-order in June so many demonstrators used it for their swaps and this pink and yellow card is very close to a sample on the display board at convention. So once again, seeing a set in use has won me over. Starting today, you can order from the Holiday Mini catalog. 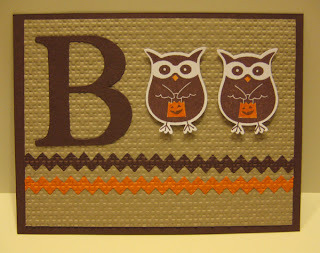 It is full of some great new products and holiday stamp sets. If you don't have a demonstrator and would like a copy, I would be happy to send you one. This is another convention swap that I copied as best I could with the supplies I have for my last Stamp-a-Stack. It was made by my friend, Shirley Casey, and is yet another way to use the Blossom Bouquet punch! Join us tomorrow (no Saturday class) for more all occasion cards.